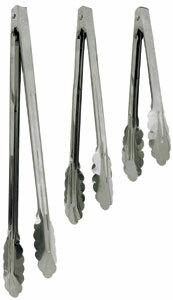 Stainless steel, heavy duty utility tongs. Available in 9 inch, 12 inch or 16 inch length. Elegant scalloped edges for secure gripping, spring action. Great for barbecues and heavy kitchen use.